I'm joking that it's my husband's fault, somewhat, but really it does have to do with my husband actually. Now, I know I shouldn't complain, because he actually does load the dishwasher on a pretty regular basis. However, I seem to go back and move everything around after he is through, because it is not how I would do it. 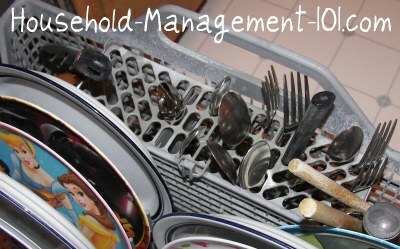 Recently, I asked on this site's Facebook page, "How do you load your dishwasher? I know this is silly, but my husband loads it one way and then I reload it another way, that I think makes the dishes come out cleaner. Am I being insane or is there a proper way to do it? Tell me your thoughts." I must have hit a hot button, because I got back lots of comments ranging from basically, "you are insane, let him help!" to "I do the same thing!" It got me thinking about it more, and what I have decided is this -- it is not the wrong way just because it is not my personal preference. 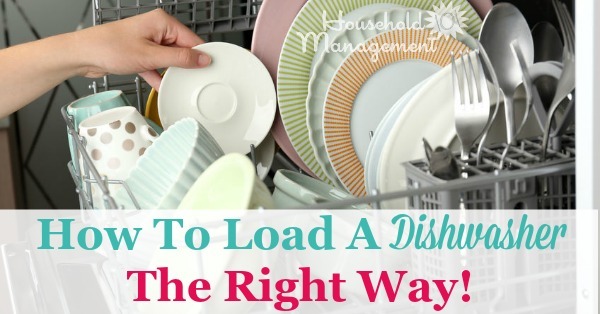 Instead, any way is fine, as long as the way it is loaded allows the dishes to get cleaned. I need to let go of my little weird perfectionist tendencies when it doesn't matter, but need to educate myself and others who assist in loading the dishwasher (i.e., wonderful husband and older children) how to load a dishwasher so that the dishwasher can do its job properly. So, I researched how dishwashers clean dishes, and some do's and don'ts for loading the dishwasher, and here is what I found out. The number one rule for how to load a dishwasher is to allow the dishwasher sprayers to reach every single item loaded into it, because that is how a dishwasher cleans your dishes. If something, like a big plate, blocks a small bowl from getting sprayed, basically when you take the bowl out of the dishwasher it really hasn't gotten washed. So make sure the sprayer can spray everything! Each dishwasher is designed a bit differently, so this article really has to speak in generalities to a certain extent. You should definitely look into your dishwasher at the sprayers and other moving parts, when figuring out how to load a dishwasher, so you get a sense of how the sprayers are positioned to tweak these suggestions to fit your dishwasher. One of the easiest ways to make sure everything can get sprayed is not to overload your dishwasher. Yes, you want to run it when it is full because this saves time and resources, but overfilling it will not allow it to wash properly. There is a line between full and overly full. 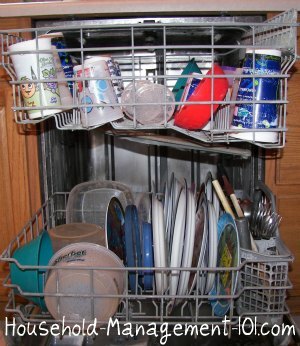 The top rack of your dishwasher generally holds your cups and glasses, and also bowls. It also should hold anything which says it is only top rack dishwasher safe. 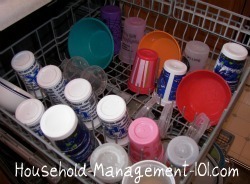 Place all the cups upside down so the sprayer can spray inside them as it works, washing each cup. Make sure any glass or ceramic cups are not placed right next to each other, but give them instead just a little space between them. As they get washed they make move and rattle a bit and you don't want them to chip or break by hitting each other. In addition, when loading bowls it is very important for them not to nest, otherwise the inside of the bowls will not get sprayed, and they won't get clean. Either lay the bowls down or let them face inward, toward the center of the dishwasher, because the most spray will get inside the bowls this way based on the design of most dishwashers. The bottom rack of your dishwasher is closer to the heating elements, so only sturdier items should be placed there like plates, pots and pans, and heavy plasticware. We personaly don't use the drying feature on our dishwasher, to save energy, so we don't worry about that as much as some would have to. The plates and other items in the bottom rack need to be placed so they face the center of the dishwasher, since this is how they are most efficiently sprayed by the dishwasher sprayers. Be careful not to place any items in your dishwasher that are too tall, and will cause the spraying spinner to not be able to rotate properly. One time, not knowing this, I placed a very tall water bottle in the bottom rack and kept hearing a "clunk clunk" sound, and was afraid my dishwasher was broken. Turns out the spinner was repeatedly hitting the water bottle as it spun around. Not good. My personal pet peeve is finding dried on crusted food on spoons when unloading the dishwasher. This generally happens when the silverware, especially spoons, get nested together and therefore don't get adequately sprayed to get them clean. To avoid this make sure silverware has adequate space for spraying on all sides. As you can see, our dishwasher basket is cool in that it has individual slots for the silverware to go in, making it easy to keep things from nesting. 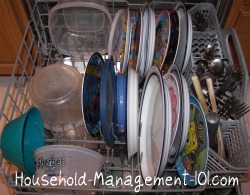 If your dishwasher has the more common baskets, you can alternate how you place the spoons and forks, some up, some down, to prevent nesting. You should always place all knives down in the baskets for safety reasons. You don't want to have to grab the sharp end of the knife when unloading the silverware basket. Now that you know how to load a dishwasher properly, to make sure it can do its job, I challenge you (and myself!) not to reload it when it is loaded by someone else unless the way it is loaded means the dishes won't actually get clean. Otherwise, just thank them for helping and move on!